I had not read Bob DeWaay before this book. My friend Gary Gilley writes the Forward and can be counted on to give good recommendations. 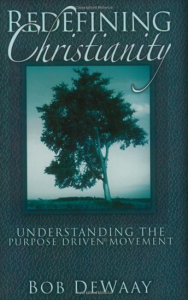 The book is a pointed critique of Rick Warren’s Purpose Driven movement. Unless you are already a Warren fan, you can’t help but agree with most of what DeWaay writes, i.e., that Warren’s version of Christianity is pragmatic to the point of being deceptive, fuzzy at best in regard to the gospel, and dangerous in regard to his socialized PEACE plan. Especially good were the chapters titled “Redefining Vision,” “How Misused Bible Translations Support a Journey of Self-discovery,” and “The Purpose Driven Brand.” As to the business principle of using a “Brand,” DeWaay shows how Warren’s empire specifically resembles a franchise with pastors as franchisees who must now use all of the system’s material and follow all the franchise instructions.